The wildfire that erupted in reserve forests bordering Theni and Virudhunagar districts on Varushanadu hill destroyed large tracts of grassland and a large number of trees, posing a grave threat to wildlife, especially grizzled squirrels, sambar and spotted deer. Local people spotted the wildfire on Saturday evening and alerted Forest department officials. But the flames spread quickly owing to strong winds on the slopes and reached Yanaikajam area, the southern side of Varushanadu hill in Theni district, destroying the habitat of wild animals. A 20-member team of officials from Forest Fire and Rescue Services struggled for hours to douse the fire. But they could not control it immediately as the land was very dry and the wind was strong. “We have brought the fire under control in most areas and are trying to put it out completely,” said B. Iqbal, Ranger, Varushanadu Reserve Forest. Lightning is said to have caused the fire when it struck a dry tree and dry grass. “If it had rained after the lightning struck, the fire could not have spread. With no rain occurring, the flames engulfed the upper hill rapidly. The high temperature in the absence of summer rain, heavy wind, and withered undergrowth helped the fire spread fast on the slopes of Varushanadu hill. Dry grass and other vegetation on two hectares were destroyed in the fire,” he added. Lack of advanced equipment and the shortage of rescue staff were major problems for the Forest department in handling tough situations. “We had faced difficulties while rescuing the injured and removing the bodies of the victims from the 300-meter-deep gorge after the major forest fire in 1,300-metre-high Kozhukkumalai reserve forest that claimed 21 lives last month. The department is in need of more sophisticated firefighting equipment and advanced training programme to the rescue teams to fight wildfire and undertake rescue operation. We need a specially trained workforce to handle such situations. 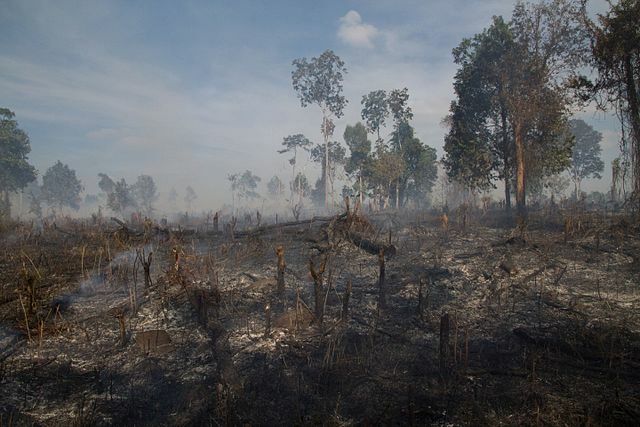 We have informed Kurangani forest fire inquiry officer Atulya Misra of the lack of such things,” he added.